Geotimes - September 2006 - Health Impacts of Coal: Should We Be Concerned? Health Impacts of Coal: Should We Be Concerned? Respirable particles, noxious gases, toxic trace elements, organic compounds and radio-active particles — these are some materials emitted from burning coal or leached from coal and coal combustion byproducts. Should we be concerned? When you learn that cancers, bone deformation, black lung and other respiratory diseases, sterilization, and kidney disease are among the health problems attributed to coal, perhaps the more pertinent question is: How concerned should we be? Uncontrolled coal fires in Witbank, South Africa, rage along a coal mining road. Such fires can contain toxic compounds that endanger the health of mine workers and nearby residents. Photograph is by R.B. Finkelman. Concerns about the impact of coal on human health are not new; they may date to its first use as a fuel in China about 3,000 years ago. In the 13th century, the dense, sulfurous air in London attracted the attention of the British royalty who issued proclamations banning the use of coal in London. Yet, use of coal still persisted worldwide, fueling industrialization (see story, this issue). Until industrialization, however, coal use was minuscule compared to the 4 billion to 5.5 billion short tons of coal that have been mined and burned each year for the past several decades. During this time, numerous epidemiological studies have documented the health impacts of materials emitted into the atmosphere by coal combustion. In the United States, these studies have resulted in federal and state regulations that limit emissions of toxic compounds from coal combustion. The mining and utility industries have responded by changing their practices and facilities to meet or even exceed the regulatory limits. Nevertheless, health problems caused by coal use still persist, particularly in areas of the world without such environmental regulations in place. Coal affects human health through several avenues — not only via direct burning, but also through mining, coal fires and other ways in which coal’s components enter the environment both naturally and anthropogenically. Although China is arguably the most notable example of where some of these sources converge, coal poses health risks globally. How much of a health threat coal poses largely depends on its composition. Coal, consisting of organic matter, water, oils, methane gas, a wide variety of minerals and virtually every element in the periodic table, may be the most complex geologic material. The composition of a particular coal is a consequence of its plant precursors, the environment in which it formed, and the processes that act on the organic matter over time. Contact with hydrothermal solutions, for example, is a crucial factor in determining the composition of coal and its potential health threat. The sulfur-rich environment of peat and coal is ideal for the precipitation of sulfide minerals containing elements, such as arsenic, mercury, lead and selenium, derived from the hydrothermal solutions. An ongoing chemical analysis by the U.S. Geological Survey of coals from more than 1,000 mines from most coal-producing countries has so far revealed less than a dozen samples with an extremely high content of potentially toxic elements, and none from major coal mines. In the early 1990s, the U.S. Environmental Protection Agency conducted an extensive study of trace elements (including arsenic, mercury, selenium and lead) released from coal-burning electric-generating utilities in the United States. The agency concluded that, with the possible exception of mercury, no compelling evidence indicated that the trace elements released into the environment caused health problems. Concerns over the possible health impacts of mercury have resulted in recent legislation aimed at reducing mercury emissions from coal-burning power plants (see sidebar). In general, if utilities are burning high-quality coal (low-ash, low-sulfur and low-trace element contents) and are using modern, sophisticated post-combustion pollution-control technology that can capture more than 99 percent of the particulates and most trace elements released by coal combustion, a very low likelihood exists of direct health impacts. Alternatively, there is every reason to be concerned if low-quality coal (high-ash, high-sulfur and high-trace element contents) is burned in an environment with poor ventilation, which is the case in many rural and developing regions. In many parts of the world, people still rely on wood or coal-fired stoves for cooking and heating in the home. In Guizhou Province, China, for example, deforestation has led residents there to almost solely use coal for heating, cooking and drying their harvests (see Geotimes, November 2001). The use of this highly mineralized coal in unvented residential environments has resulted in severe health problems for an estimated 10 million people. The coal in this region has a unique set of characteristics that increase the health threat posed to residents. 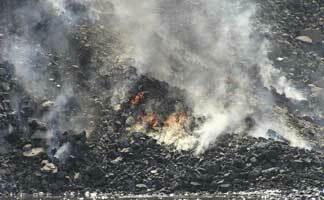 Some of the coals have arsenic contents as high as 35,000 parts per million. The average arsenic concentration in coals elsewhere in the world, including other parts of China, is generally less than 25 parts per million. Additionally, because much of the arsenic in the Guizhou coals is associated with the organic components rather than easy-to-remove pyrite inclusions, as is the case elsewhere, the arsenic cannot be removed or recognized in hand specimens. Chili peppers dried over coal containing high arsenic concentrations have resulted in thousands of cases of arsenic poisoning in the Guizhou Province of China. Photograph is by H.E. Belkin. In the cool, damp fall, residents hang crops such as chili peppers and corn from the rafters of their homes to dry over the coal fires. 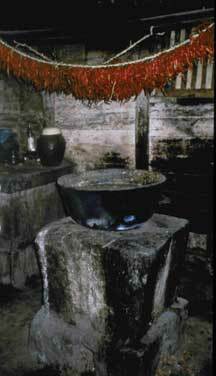 The chili peppers dried in this manner absorb large contents of arsenic from the coal. Ingestion of the arsenic-bearing chili peppers, as well as inhalation of the volatilized arsenic, has resulted in thousands of cases of severe arsenic poisoning. Such poisoning can lead to conditions such as hyperkeratosis — in which brown, scaly patches cover the body — and Bowen’s disease, which is a pre-cancerous condition. In a somewhat broader geographic area, millions of Chinese villagers are suffering from dental fluorosis, which is the mottling of the dental enamel, and skeletal fluorosis, which is the precipitation of fluoride biominerals in joints. The fluorine, concentrated in the dried corn, is ingested as well as inhaled and comes from both the coal burning the corn and the fluorine-rich soil that the villagers use as a binder in their homemade briquettes. In the same region of China, villagers are using coals containing from 20 to more than 50 parts per million of mercury (the average concentration of mercury in coals in China and elsewhere is less than 0.2 parts per million). The extraordinarily high levels of mercury in these coals may be a contributing cause to the very high incidence of neurological conditions, including blindness in the elderly people, in this region. Where low-quality coal exists elsewhere, other problems persist. Trace elements mobilized from coals being burned in power plants have also been cited as causing health problems. An epidemiological study of a coal-burning power plant in the former Czechoslovakia, which used lignite (very low-quality coal) with high concentrations of arsenic (about 800 parts per million), found that children living near the plant had a marked loss of hearing that was attributed to the arsenic exposure. Fortunately, such highly mineralized coals are quite rare. Burning coal in power plants to generate electricity and as a commercial or residential source of heat consumes virtually all of the 5.5 billion short tons of coal mined each year. However, hundreds of millions of tons of coal are lost each year to uncontrolled coal fires in dozens of countries around the world. These fires, started either accidentally by coal mine accidents, lightning strikes or spontaneous combustion, or started intentionally, emit enormous quantities of potentially toxic trace elements and noxious gases. A recent study on a coal mine in South Africa demonstrated that these coal-fire gases contained toxic levels of benzene, toluene, xylene and ethylbenzene. These highly toxic compounds would be destroyed at the higher temperatures achieved by coal-burning power plants, but are widely released in mine fires, due to the lower temperatures. One report estimates that 2 to 3 percent of annual global carbon dioxide emissions are coming from uncontrolled fires in China. The most common minerals precipitating around the vents from which these gases are escaping are sulfur compounds followed by arsenic-, selenium- and fluorine-bearing minerals. Mercury also has been detected in these precipitates. The health of mine workers and nearby villagers is clearly at risk from these emissions. In India, an entire village is being relocated because of the health impacts caused by a nearby coal fire. Clearly, people working or living in proximity to uncontrolled coal fires are at very high risk of health consequences. Although coal mining and coal combustion are mature endeavors, new information is still emerging on their health consequences. Black lung disease (or coal worker’s pneumoconiosis) has long been associated with coal mining. It is a debilitating respiratory disease caused by fibrosis of the lung resulting in diminished ability to exchange oxygen. For a century or more, people have assumed that black lung disease is caused by inhalation of black coal dust. However, recent work has shown that finely divided pyrite particles may be necessary to initiate the inflammation of the lung tissue. Solutions to health problems do not have to be sophisticated or costly. 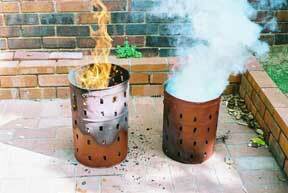 Igniting the top of a coal-burning container (left) can significantly reduce potentially toxic emissions over the traditional method of lighting the coals from the bottom (right). Photograph is by R.B. Finkelman. The fine-grained pyrite dissolves in the lung, generating highly acidic fluids and releasing iron that causes inflammation of the lung tissue. When a foreign particle (coal dust, quartz, clay or pyrite, for example) is deposited on the irritated lung tissue, the fibrosis process is initiated. Other processes can lead to forms of cancer. Chromium in coal is generally present at 10 to 20 parts per million. All of this chromium is present in a benign form. However, when coal is burned in an oxygen-rich environment, as much as 50 percent of the chromium can be converted to a highly carcinogenic compound. This compound condenses on the surface of the fly ash particles formed from coal burning and is predominantly water soluble, thus presenting a potential health problem to people who are exposed to this fine dust. Preliminary data indicate that the oxidation of the chromium is not a common phenomenon in U.S. power plants and, for the most part, those at risk would be power plant workers handling the fly ash. Other regions have not studied the phenomenon. Other problems relate to more unseen leaching of coal byproducts into the environment, such as lignite affecting water sources. Lignite has been cited as a contributory factor in a severe, debilitating kidney disease that has associated urinary tract cancers. The disease, known as Balkan endemic nephropathy, occurs in clusters of villages in the former Yugoslavia and in Romania, with one known occurrence in Bulgaria. Records since the 1950s have shown that thousands of people in the endemic villages have died from kidney failure and related health problems. In all of the villages, a common factor is that the primary source of drinking water is wells that draw from lignite aquifers. Analysis of the well waters has revealed extremely high concentrations of toxic organic compounds. Similar compounds have been water-leached from these lignites in the laboratory. Researchers have thus postulated that these organic compounds, leached from the lignites, are significant contributory factors in causing Balkan endemic nephropathy. Recent studies have demonstrated a similar suite of organic compounds in water from wells underlain by lignites in Louisiana. This area is known to have one of the highest incidents of renal and pelvic cancers in the United States. In Portugal, a region where lignites were once mined coincides with the highest incidence of kidney disease in the country. In evaluating the health impacts of coal, it is important to remember that not all of the health concerns attributed to coal are valid. Periodically, for example, reports in the scientific and public literature have discussed the threat of radioactivity from coal and coal combustion products. One of the more serious accusations is that young boys playing near disposal sites of coal combustion byproducts will be sterilized by the radiation. This is pure fabrication. Although some coals have relatively high concentrations of uranium, for example in North Korea and China, these coals are rare, and none are currently being mined in the United States. The levels of radioactive particles in coal and coal combustion byproducts are generally low to modest, commonly in the same range as many surficial rocks and soils. Radon, a daughter product of uranium decay, may present a legitimate health concern to coal miners working in poorly ventilated mines, however. In the end, should we be concerned about the health impacts of coal? Yes — any prudent person should be concerned and should encourage and support efforts by the government and industry to reduce emissions from coal combustion until such time that a viable energy alternative is available. But when it comes to the question of how concerned should we be, it depends on an individual’s proximity to a coal combustion source, the amount and type of coal being burned, the technology employed in the combustion process and other factors, such as the individual’s state of health. The direct health problems caused by coal and coal use are generally local, but potentially severe. Nevertheless, once identified, practical solutions are available. For example, simple field test kits for the determination of arsenic in coal have been developed and distributed to villages in Guizhou Province. With these kits, the villagers can easily and quickly determine the arsenic concentration of the coal samples they collect. Another simple way to reduce health problems caused by coal is to ignite the top of a coal-burning container rather than the bottom. Such a quick fix significantly reduces toxic emissions. For people living in areas where high-quality coal is burned in modern boilers with the best available pollution control technology and sensible coal combustion byproduct disposal practices, the health threat is probably minimal. Nevertheless, more research is necessary to assess the effects of long-term, low-level exposure to effluents from coal-burning power plants. Coal burning in the United States is cleaner today than in the past, thanks to scrubbers and other technologies in power plants that remove pollutants, such as sulfur dioxide and nitrogen oxides, from the coal’s combustion gases. The emitted gases, however, also contain trace amounts of elemental mercury and are now known to be responsible for dispersing the toxic chemical far and wide. Once it is deposited from the atmosphere into soils and aquatic ecosystems, microorganisms can convert the elemental mercury to “methylmercury,” a highly toxic form that accumulates in the tissues of fish and birds — and, eventually, humans (see Geotimes, August 2003). Mercury poisoning can ultimately lead to neurological, cardiovascular and other health problems. How to regulate the mercury in those emission gases has been the focus of more than a decade of deliberation, but as a result of a recent, long-awaited ruling by the U.S. Environmental Protection Agency (EPA), mercury emissions may soon wane. In May, EPA finalized its March 2005 Clean Air Mercury Rule, which proposed to use a market-based approach to reduce mercury emissions by 70 percent by 2018. EPA’s announcement marks the first federal rule to limit mercury emissions from coal-fired power plants — capping seven months of reconsideration of EPA’s March 2005 rule, as well as of a separate 2005 decision to remove mercury from EPA’s list of toxic air pollutants. Mercury was originally added to the toxic pollutants list in 2000, a designation that would have required its immediate regulation as a hazardous substance. That designation also would have precluded the possibility of regulating mercury using a “cap-and-trade” approach, which creates a financial incentive for companies to limit emissions by establishing a national emissions limit, or “cap,” and dividing up emissions permits among companies. Such a program then allows companies that decide it is too costly to reduce the pollutant themselves to purchase emissions “credits” from other companies that have managed to be under their permitted limit. That sort of market-based approach had earlier been proposed by President Bush in his 2002 Clear Skies bill, a plan to simultaneously regulate three pollutants from coal-fired electric power plants: sulfur dioxide, nitrogen oxides and mercury. That bill stalled in Congress, however, due to concerns that Clear Skies would significantly undermine the Clean Air Act by allowing companies to sidestep already existing controls over other contaminants and technologies (see Geotimes, May 2005). In addition to the Clean Air Mercury Rule, EPA chose a separate cap-and-trade program for control of sulfur dioxide and nitrogen oxides, leaving the Clean Air Act intact. Opponents of EPA’s plan to limit mercury emissions, however, maintain that the proposed market-based reductions still fall far short of the 90 percent across-the-board reductions proposed in 1998. Furthermore, they say, reductions under the new plan will not happen quickly enough. In response to the proposed rule, two separate petitions — one signed by 14 of the most affected states, including New York, Pennsylvania and Wisconsin, and the other signed by five environmental groups and four Indian tribes, urged EPA in October 2005 to reconsider both mercury’s removal from EPA’s list of toxic air pollutants and using a cap-and-trade approach to limit mercury emissions. The opponents feared that, for a toxic chemical such as mercury that tends to accumulate in the environment, such an approach could lead to contamination “hotspots” near the plants that buy extra permits rather than limiting their own emissions. In its final decision, however, EPA chose to uphold both decisions, asserting that the December 2000 addition of mercury to the list “lacked foundation,” and that the plan, as it stands, will ensure sufficient mercury reduction. The first phase of the plan, which lasts through 2010, sets a cap on mercury emissions of 38 tons per year, down from the current 48 tons. By 2018, under the plan, the program will be fully implemented, with the final mercury emissions cap at 15 tons. Finkelman is a research professor at the University of Texas in Dallas, who recently retired from the U.S. Geological Survey. He previously wrote an article on medical geology for the November 2001 issue of Geotimes. Belkin is a research geologist with the U.S. Geological Survey in Reston, Va., where his research interests focus on coal and human health issues. Centeno is a Senior Research Scientist at the Armed Forces Institute of Pathology, and an associate editor of Essentials of Medical Geology (2005).